Swimming, boating, walking trails, fishing, tennis, beautiful parks and elegant homes - this is Northbay of Madison, Mississippi. No other residential community in the entire Jackson metropolitan area offers such a complete range of amenities.Located at the water's edge is Mississippi's most desirable suburb. 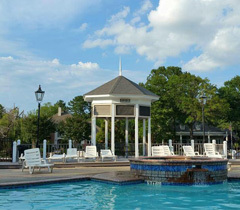 Northbay residents enjoy a unique and wonderfully comfortable way of life. So come with us now and explore. Let us show you why more than 500 families call Northbay home. Set within the beautiful Madison countryside, Northbay is more than just a place to go after work; it's a total living experience. It is a neighborhood where residents enjoy and appreciate all of those well-earned, special moments life has to offer. It is truly a neighborhood with a network of sidewalks connecting most homes. Our wooded home sites are nestled among walking trails, beautiful parks and lakes. There's no other community quite like it.